MyPaperEden: Can you make origami waterproof? 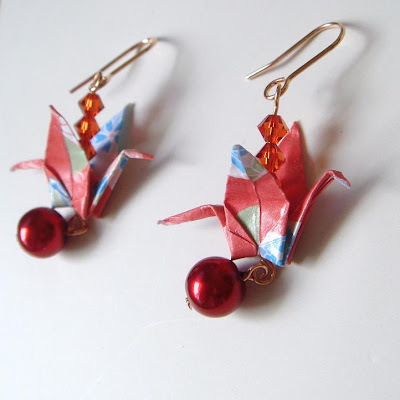 Someone saw my paper cranes earrings and asked me on Twitter : " Is there a way to make them waterproof? " First of all i would like to tell the world that (takes a deep breath and screams!) "All my items on Etsy ARE water resistant!" haha. Yes There is a way to make origami pieces water resistant. People want to do this for a number of reasons. To make a piece weather resistant. This applies heavily for my case. 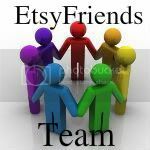 I turn paper into craft and jewelry pieces i hope someone will wear and treat like any of their other accessories. I don't expect you to go scuba diving with my beads, but they must function fine under the rain, snow... tap (i wash my hands with paper bead bracelets on all the time). - Gloss and glue are used to make a piece of origami resistant to water. They also give the paper some hardness. Depending on the number of layers and type of gloss you apply you can make a piece totally stiff and unbebdable or in the case of these paper earring you can move the wings, head, tail but only with a little pressure. - Standing origami. Sometimes a piece of origami looks great but your crane or horse or dragon cant stand upright on its own. Using something to harden up the paper a little may help with this. Not all the time but it may allow you to display your structure upright. As to how exactly to coat a piece and with what type of glue/gloss, stay tuned in my next post. I don't want to type a whole chapter each time i make a blog post haha. Ever hear of "wet folding" David Brill uses it in "Brilliant Origami" But it NEVER works for me. Last night I tried it on my beetle and disaster! I have tried poly gloss dipping small butterflies. It changed the color a bit and I had to get creative with the drying process. In the end, they were fairly rigid but not glossy. I have used "wet folding" for one of David Brill's model... and can you use transparent nail polish (the glossy) type to waterproof the origami models?, i have used wood varnish it does look good but smells awkward... What kind of gloss is best suited??? I love those earing and would wear them. My question what kind of glue or gloss can I use to make the paper beads more glossy and waterproof, also can I make home made varnish and how.